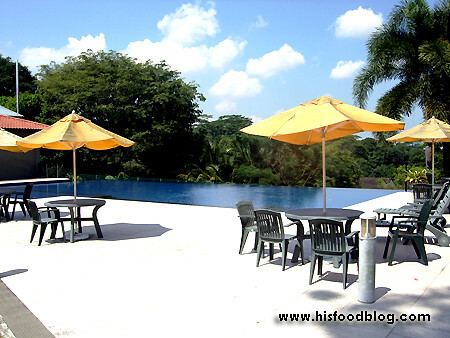 Nestled next to an infinity pool overlooking the greenery in a tranquil and serene environment, one would imagined they are transported to a luxury resort and exotic villas of sorts – but instead Izzi Restaurant & Bar (pronounced as “Easy”) is located at the Ngee Ann Polytechnic Alumni House, at the end of the road leading to SIM University. Established since June 2010, Izzi Restaurant & Bar opens to public from Monday to Sunday and offers FREE Parking! What’s more, students of SIM and Ngee Ann Polytechnic can enjoy 10% discount off their total bill! And if that’s not generous enough, how does Club Members, along with staffs of Ngee Ann Polytechnic get to enjoy 20% discount off their meal sounds!?! 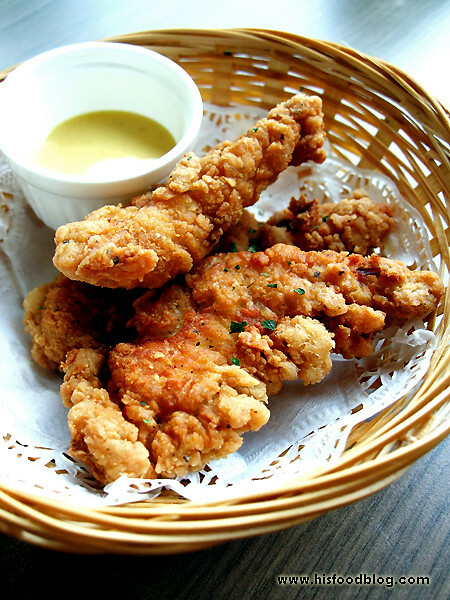 For a start, give the Chicken Tender Strips ($6.00 for 3 pieces) a try. This crowd pleaser with its crusty exterior, along with its accompanying sesame sauce – that was tangy and great to dip in – was simply a delight to munch on. This was highly addictive! Fancy something out of the ordinary? 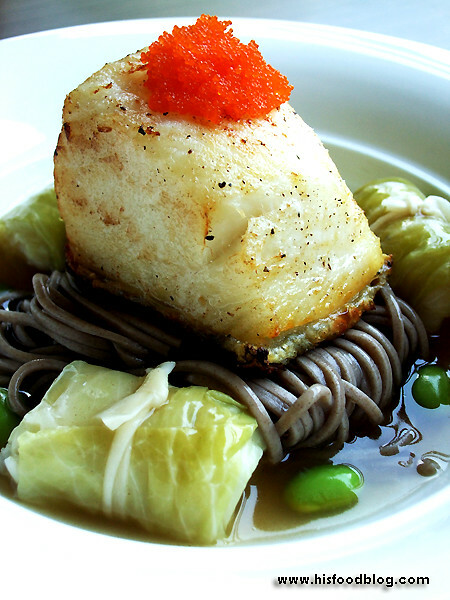 Why not sample the Oven-baked Cod Fish served with a Japanese twist of Cabbage Rolls & Soba Noodles in Seafood Broth ($30.00). A smooth and creamy texture, HFB was pleasantly surprised and took delight by the cabbage that was wrapped with seafood paste. 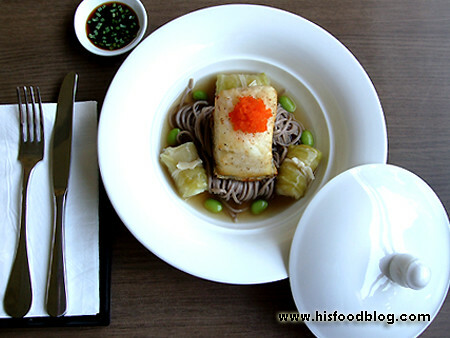 Slurping the soba was also blissful as the seafood broth harmonised the noodles perfectly. Really enjoyable! The Pork Chops ($9.70) was unquestionably a valued option for students seeking a good deal. A 200grams of nicely seasoned and charred pork collar chops comes with 2 choices of sides and accompanying sauce. And if one is up for something spicy, the Black Pepper Sauce is definitely the obvious choice! 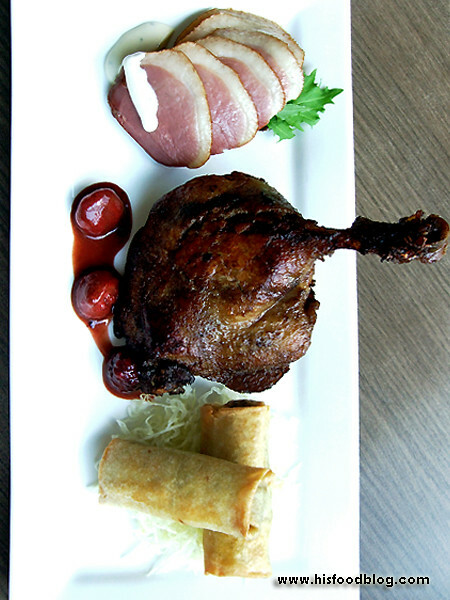 Part of the Chef Recommendation Menu, the Duck Platter ($30.00) consists of a trio of dishes – Duck Confit, Cold Smoked Duck Breast, and Shredded Duck Meat & Vegetable Spring Roll, served with Mash Potatoes and Berry Sauce. HBF started with the spring roll that came stuffed with generous shreds of duck meat. Splendid! HFB also cannot help but got distracted by the luscious and glistering smoked duck breast and he wasn’t disappointed – it was really flavourful and HFB beyond a doubt enjoyed it. 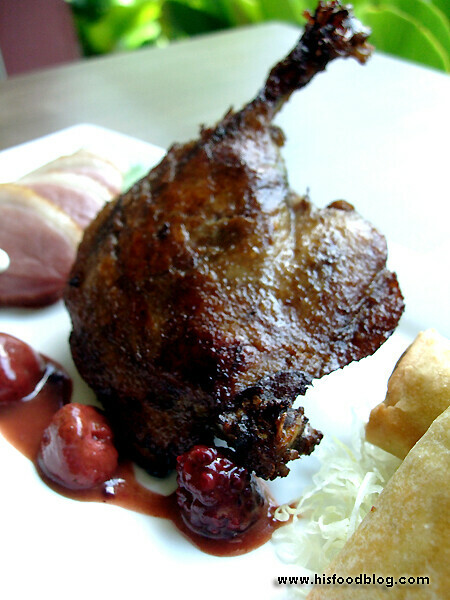 But the highlight of the dish was definitely the duck confit that was savoury and came with nice crisp skin and fork-tender flesh. The tangy berry sauce which provided a nice balance to the palate also offered a nice finishing to the hearty dish. Magnificent!! 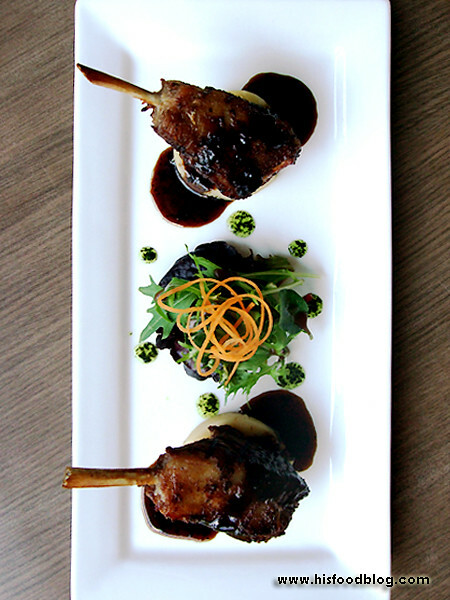 Cooked to a perfect medium finishing, HFB thoroughly enjoyed the Lamb Rack ($30.00) in Red Wine Mint Sauce. The meat was flawlessly tendered and juicy the way it should be. The meat that was nicely charred along with the accompanied sauce was a marriage-made-in-heaven – red wine provided the depth for the red meat while mint sauce is a classical pairing for lamb. This dish fully deserved maximum marks for execution, and strongly endorsed by HFB. How does than an aromatic cup of Hazelnut Latte ($4.60 for regular, $5.30 for large) after meal sounds? 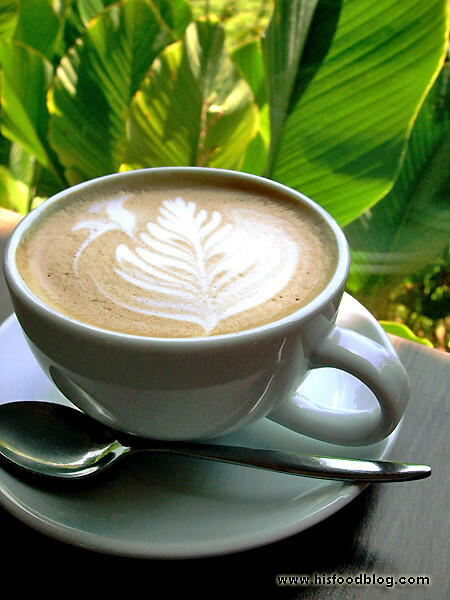 A perfect ending HFB must say – along with the latte art to admire at the same time. 1. ALL participants who answer the following question correctly will receive a 20% discount voucher off all food items at Izzi Restaurant & Bar. 2. In addition, all diners who present the discount voucher will stand a chance to enter in a lucky draw where THREE winners will be picked to win food voucher equivalent to the amount they spend (on food only) on the day they dine. Q. 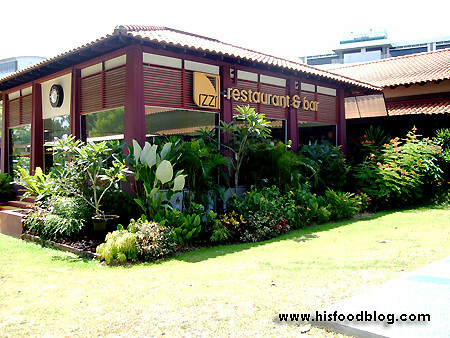 When did Izzi Restaurant & Bar join Facebook? Please send your answer to shanielui@mabuilders.com.sg with your Name, NRIC, and Contact Number. Closing date for this contest is 2359 hrs, 31 Oct 2012 (Wed). • The food voucher is only valid at Izzi Restaurant & Bar from the date of issue and is non-transferable; non-refundable and not exchangeable for cash. • The food voucher is not replaceable if lost, stolen, torn, damaged or defaced. • Only one food voucher can be used per transaction and cannot be combined. • The food voucher must be fully redeemed. Any unused value will be fortified. • Reservations are recommended. Please state use of food voucher when making reservation. • The food voucher is not valid unless it is duly stamped and signed by authorised personnel. 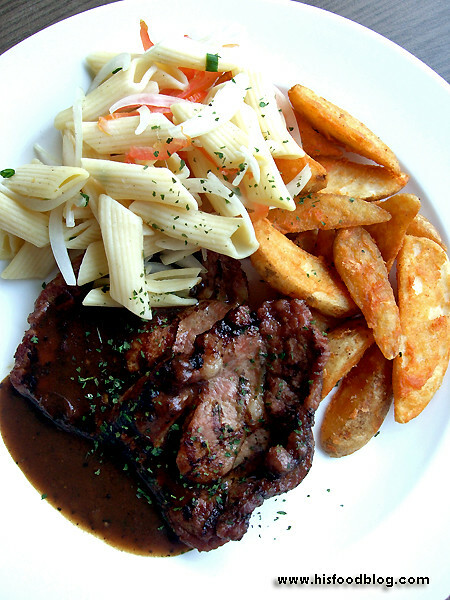 • Food voucher may be redeemed for food menu only, excluding beverages of any kind. • Please note that only original certificates will be accepted and kindly present the food voucher when you dine at the restaurant.